Vancouver Whitecaps' Alphonso Davies celebrates his goal against Orlando City during the second half of an MLS soccer game in Vancouver, on June 9, 2018. 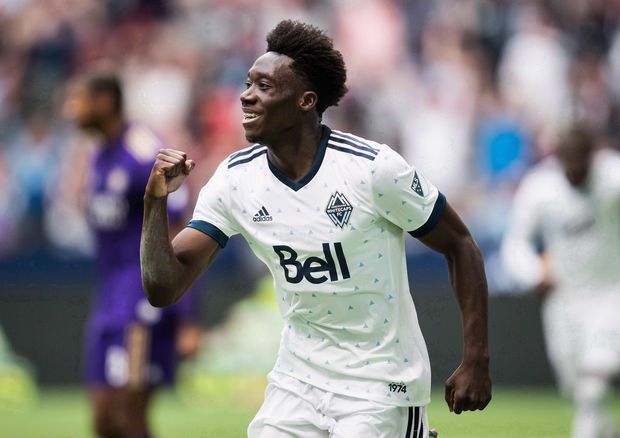 The Vancouver Whitecaps could be without their teenage phenom when they battle their West Coast rivals in a key contest. No explanation was given for his absence on Friday. Davies has three goals and eight assists this season, and the Whitecaps (7-8-5) likely would miss him in what figures to be a hotly contested match. Vancouver, sitting two points out of a playoff spot, has lost four of its past five games, while Seattle (4-9-5) is on a three-game unbeaten streak. The teams have long been regional rivals, a dynamic that only intensified when the Sounders ousted the Whitecaps from the playoffs with a 2-0 win in November. In regular-season play last year, each team notched a win on home turf. A third game in Vancouver last August came to a 1-1 draw. Striker Kei Kamara hasn’t yet played the Sounders as a Whitecap, but said he’s looking forward to a match that has a bit of extra bite. Chasing much-needed points will increase the game’s intensity, Vancouver keeper Stefan Marinovic said. Marinovic was back in net for the first time in 10 games Wednesday, when the Whitecaps lost 1-0 to the Impact in Montreal in the first leg of a Canadian Championship semi-final. After spending nearly two months on the sidelines with a knee injury, being back in net felt comfortable, the goalie said. “To finally get 90 minutes under my belt feels really good,” he said. Vancouver needs all the healthy players it can get as the team slogs through a packed schedule of five games in 15 days, including matches in Washington, Montreal, Seattle and Vancouver. Coach Carl Robinson said he’s trying to keep his crew fresh by rotating players. Wednesday’s match in Montreal saw midfielder David Norman Jr. make his debut with the Whitecaps first team. Whether captain Kendall Waston will be back in the lineup Saturday remains to be seen. He’s been out with a groin strain since the beginning of the month, but trained with his teammates on Friday and said he’s feeling great. “I don’t feel no pain so now it’s [coach’s] decision,” he said. Robinson said he’ll make a call Saturday morning about whether or not Waston is in the lineup. “It’s going to be a very difficult game for us,” Robinson said. “We’ve been playing well at times recently, we’ve been making little errors at times. We need to try and eliminate those but also put our stamp on the game.